Simply take a vintage napkin or linen coaster. Simply fold the raw edge under and pin onto the neck line. And then cut in half. Check your happy with both sides and then sew. I never throw away broken jewellery. I store it in a box and it can come in super handy. Select a few pieces you like without judging what is wrong with them. I love UHU craft glue or Gorilla gel sure glue. Simply glue your jewels, beads or sparkles on to the leather, leave to dry and add to any boot! All that is needed then is to add the skirt. I took the elastic off the skirt and stretched the fabric to match the hem of the top. 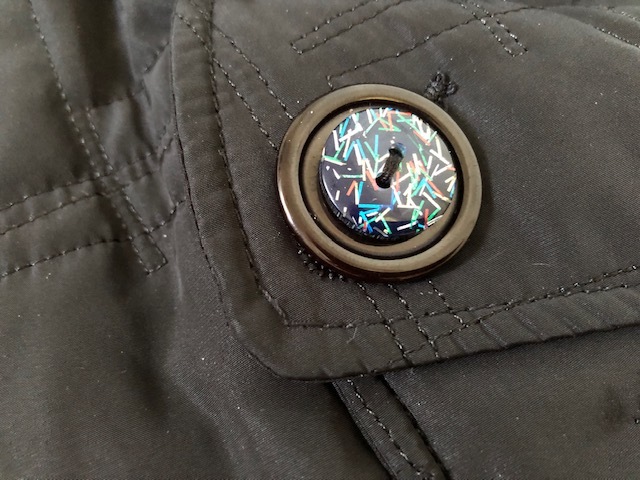 Pin into place and the sew together. I wish someone had told me years ago that recycling vintage clothing would be so refreshing and fun. For years I have collected vintage clothing from flea markets, shops with no changing rooms, market stalls you name it - I’ve need up with a tonne of fantastic ‘finds’ that don’t always fit. I’ve kept these clothes for ages, not wearing them and yet also too afraid to make changes. Well, that has changed. This year I decided to use what I have. if something doens’t fit and I cant wear it then something has to change. I.e chop chop ✂️. 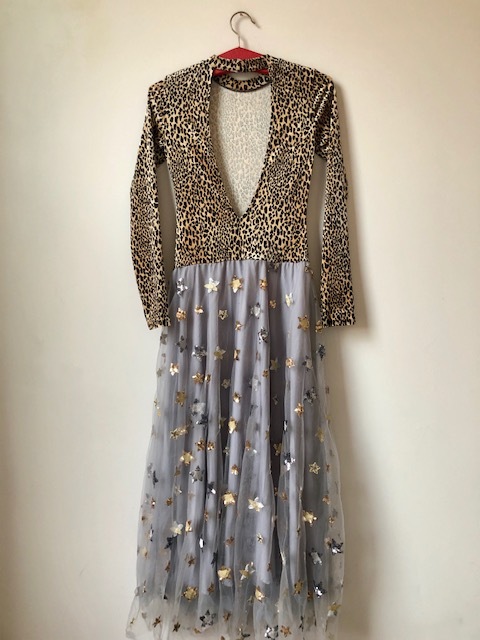 For example this dress is simply made by chopping the skirt off of a 1980s Zandra Rhodes dress (the bodice didn’t fit and even if it did - I wouldn’t have worn it). I then attached the skirt to a tunic top. The tunic is hand embroidered and totally stunning. As simple as that! one line of stitching. I just about to take a couple of bags to the charity shop when i thought id have a last look inside them - I find throwing things out so hard. Firstly they them immediately seem to come back into fashion or suddenly you decide you cant live with out them. Yesterday I was brutal with myself - in or out and when they were an out they went straight into a bag for charity - no looking back. I struggles with throwing t-shirts out because I reuse them so much but these two t-shirts were too small and even i hear in the ;fashion news’ small , cropped t-shirts are on there way back… I’m 44 and not sure if I’m up for that look now. But it suddenly occurred to me that two t-shirts could easily make one. All I had to do was cut them into two and sew them together. Obviously being small I didn’t want to cut them in half - see below for how cut them them. taking the two larger sides I them turned them inside out and sewed them together. And that was literally all I did. I have an over locker machine so used this but as t-shirt material doesn’t tend to fray, a simple sewing machine would also work. This dress is so easy to wear and so easy to make. It is aldo great because it can be made with items of clothing that we have hanging around in our wardrobes that probably we no longer wear. I used an old t-shirt that has a few holes and rips, these can be mended or left to add to character. Firstly I then took a cotton skirt and cut the waist band off. Then I took the t-shirt and cut it below the armpits across the whole of the t-shirt so it was left resembling a cropped top. Turning the t-shirt top and the skirt inside out, I placed the edges together. Simply running it through the sewing machine using a running stitch I sewed them together. I stretched the skirt to match the same length as the circumference of the t-shirt an pined them together before sewing them. You can 'zig zag' finish the raw edges of leave them raw. I love heavily embroidered dresses but one thing i have noticed is that they are heavy, literally heavy to lift and heavy there fore to wear. For while I didn't now what to do but then I decided to take the plunge and remove some of the weight. The sleeves of this dress are amazing but heavy and long, in fact because of this I have never worn the dress. I decide to literally chop the sleeves off and use then on another idea (tomorrows post). There was nothing special about what I did, taking a pair of scissors I cut the sleeves off leaving enough for me to double turn the raw edge over and sew to create a simple and neat hem. And that is it. I know have a great dress that is easy to wear and amazing trim to create another great project. Never, have a fear of changing something. I look at everything with the the thought of how can I make a change.. obviously not everything I purchase, find or have needs changing or t be up cycled but often I see things love but they don't fit. For example, I loved this shirt and found it in Traid for £10. Sadly it was enormous on me, everything about it swamped me. I thought about shortening the sleeves but again it was going to be massive. So it occurred to me that if I lost the sleeves, then although the body of the shirt would be big but I wouldn't be swamped. So I decided to upcyle - Upcycling is the opposite of downcycling, which is the other half of the recycling process. Downcycling involves converting materials and products into new materials of lesser quality. Most recycling involves converting or extracting useful materials from a product and creating a different product or material. Turning at item that I can't or wouldn't use into something I'm going to love to wear! Literally, I cut the sleeves out. I cut them out of the arm hole, leaving the leather fringing to hang over the arm. Sometimes all you need are scissors ✂️.